Welcome to The Division of STD Prevention and Control website. The Division works to identify populations at increased risk for sexually transmitted infections in order to reduce transmission to others and the development of related complications. Did you know that you are 5 times more likely to contract HIV if you already have an STD? Free STD and HIV tests are available at your local Health Department, or you can access free HIV testing care with these organizations. 1 in 2 sexually active young people will get an STD before the age of 25. Most will not know it. Get Yourself Tested. 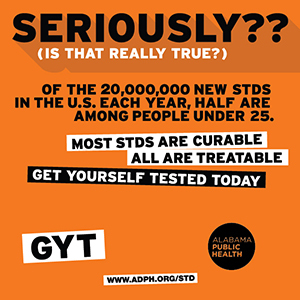 To control STDs, the Alabama Department of Public Health 67 County Health Departments operate free, confidential STD clinics statewide. Free testing and treatment is provided for chlamydia, gonorrhea, syphilis and HIV. To find the closest clinic near you, contact your nearest County Health Department. The Sexually Transmitted Infection (STI) Resource Center Hotline is a program of the American Social Health Association (ASHA) that provides information, materials and referrals to anyone concerned STIs. Health Communication Specialists are on staff to answer STI questions on such topics as transmission, risk reduction, prevention, testing, and treatment. The hotline, 1-919-361-8488, is open from 8:00 a.m. to 7:00 p.m. (CDT, Monday through Friday. If you have difficultly reaching a Health Communication Specialist, feel free to access their online STI information section to find answers to questions you may have. CDC's Division of STD Prevention announced the launch of its STD Treatment Guidelines app. "STD Treatment Guide" is designed to help users easily access information in the CDC's 2015 STD Treatment Guidelines. Medical providers who use this app will have a quick access to information about the diagnosis and treatment of STDs and the useful booklet, "A Guide to Taking a Sexual History." The app is available for both Apple and Android devices and can be downloaded for free from the iTunes and Google Play Stores. For more information about the app, please visit the STD Treatment Guidelines. This site contains STD prevention messages that may not be appropriate for all audiences. Since STDs are spread through sexual practices, prevention messages and programs may address these topics. If you are not seeking such information or may be offended by such materials, please exit this website.